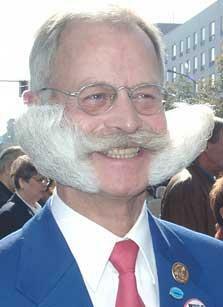 Picking the big winners at the World Beard and Moustache Championships in Berlin 2005 on October 1 is no easy task. Don’t despair! My predictions are below. This year, there will be no single overall winner. Instead trophies will be awarded in each of the seventeen categories as well as in each of the three overall classes – moustaches, partial beards, full beards. Germany, has been the undefeated world champion in the Hungarian (or Wild West) moustache category since 1997. His winning streak started two years before Lance Armstrong’s streak in the Tour de France. 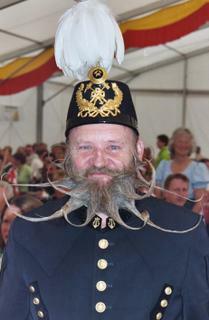 Rosin also took top honors in the moustache class at the recent beard Olympics held in Austria. Don’t try talking to Günter before he takes the stage on competition day – he requires absolute peace and quiet as he prepares to compete. Unlike Armstrong, Rosin has no plans to retire. Only one person on earth has ever been crowned overall champion at the World Beard and Moustache Championships – Berlin’s silver-bewhiskered Karl-Heinz Hille. He took top honors in Sweden in 1999 and again in Carson City in 2003. (There were no overall winners chosen at other WBMC’s.) Add to this the home court advantage and Hille should be the odds-on favorite. Not so quick! Karl-Heinz finished a disappointing third in his category (Imperial cheek beard) and therefore did not qualify for the final judging at the Beard Olympics last May. Nevertheless, I’m sticking with KHH because of his judge-appeal. This is a tough one. The top finishing full beard in Carson City belonged to Alaskan David Traver, who cannot make it to Berlin. I am going to go with Austria’s Hans Gassner, who competes in the full beard freestyle category. Gassner was the sentimental favorite at the Olympics where he took home the trophy in this class. He didn’t have to take the trophy very far, as the Olympics were held in his home town of Leogang. OK, that is where I am putting my money. Remember where you heard it first. Phil, You are the best! Carol and I had a trip of a life time because of the wonderful efforts you put in to arange travel, lodging and great side trips. Your efforts for this amature event were beyond anyones highest expectations. quand joe dassin chantait "l'amérique" se doutait-il de cela ? The ladies love a good stache. Some even develop their own competition. This is an awesome blog post, Thanks very much for the share. Keep posting. Thanks! Well these are some of the best moutache's I have ever seen. Interesting photos and the article is also very interesting. Thank you for sharing the post. it seems the problem has to do with language. There is no word in German for moustache. Your predictions are logical as well..I wish I could go to the Championship ceremony.. Very funny . But I like to having those kind of Moustache . There will be no single overall winner. Instead trophies will be awarded in each of the seventeen categories as well as in each of the three overall classes – moustaches, partial beards, full beards. Germany, has been the undefeated world champion in the Hungarian (or Wild West) moustache category since 1997. Lately i read so many articles about this topic but i can honestly say that your point of view is the best there are. Talking about the nuts they are really good for health too in many aspects..